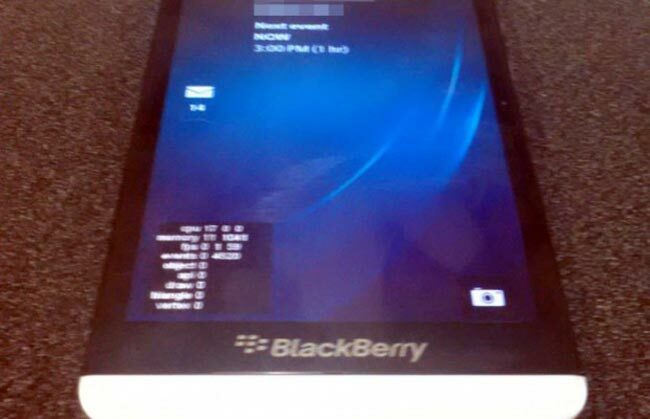 We have already seen some photos and a video of the new BlackBerry A10, and now a slide has been leaked showing the BlackBerry A10 specifications. The BlackBerry A10 will feature a 5 inch full HD OLED WXGA display with a resolution of 1280 x 720 pixels, the handset will be powered by a dual core 1.7GHz Qualcomm MSM8960 processor and it will also feature 2GB of RAM. 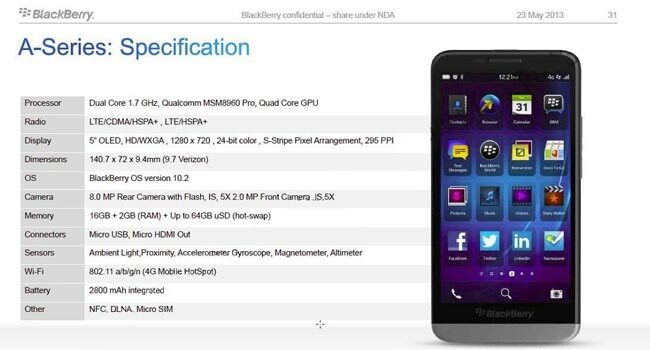 Other specifications on the BlackBerry A10 include 16GB of built in storage plus an SD card slot which can take up to 64GB of additional storage. The BlackBerry A10 features front and rear facing cameras, on the front of the device we have a 2 megapixel camera, on the back there is an 8 megapixel camera with a flash. The A10 also comes with a range of sensors, which include Ambient Light, Proximity, Accelerometer, Gyroscope, Magnetometer, Altimeter. There is also a 2,800 mAh battery, NFC, DLNA, a microSIM card slot, microUSB, MicroHDMI and 802.11 a/b/g/n WiFi. As yet we do not have any details on when the new BlackBerry A10 will be available, as soon as we get some more information we will let you guys know.